The Federal Government on Monday began the screening exercise for about 750 food vendors to be engaged in the National Home Grown School Feeding Programme, NHGSFP, in Abuja Municipal Area Council, AMAC. 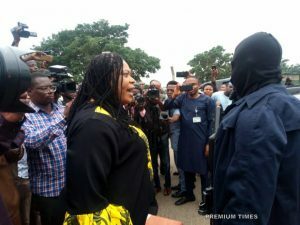 The exercise which took place at the Local Education Authority, LEA Secretariat, Wuse 2 Abuja, in the Federal Capital Territory, FCT, witnessed a large turnout of the vendors who are mostly women. FCT Coordinator of the programme, Victoria Aleogena, told newsmen at the exercise that successful applicants would be engaged in feeding of pupils in 158 public primary schools within AMAC. She said that the process of selecting the vendors was done in a transparent, peaceful manner devoid of political and godfather interference. “The screening exercise for AMAC vendors which began today has been smooth and the applicants have conducted themselves in peaceful manners. “As you can see, this is done in the glare of public and transparency so that a level playing ground is given to all Nigerians interested to take part in this school feeding programme. “We have been in other area councils under the FCT and we have recorded success and cooperation of all stakeholders’’ she said. She said that ballot system was applied to select vendors for schools where applicants were more than the number required. She said the next stage would be medical screening and food handler test to be conducted for successful applicants by officials of Public Health Department of the FCTA. She explained that the importance of the test was to ensure quality assurance and good food hygiene as mandated by the Federal Government. Also, Mrs Adesanmi Abimbola, the National Programme Manager of the NHGSFP under the Office of the Vice President, Prof. Yemi Osibanjo, said government was committed to achieving 100 per cent success in the programme. Adesanmi urged the applicants to see the programme beyond just cooking foods for the pupils, but food value chain activities capable of creating other jobs and alleviate poverty. LEA Secretary in AMAC, Haruna Saidu Karshi told NAN that the project would be supported by all stakeholders in the primary education level. He lauded President Mohammadu Buhari for the initiative and called on the prospective vendors to operate by the guidelines set by officials of the programme. NAN reports that the screening exercise is part of the preparations to ensure smooth take-off of the feeding programme in FCT scheduled for January 2019. NAN also reports that AMAC is one of the six area councils where 120,300 pupils are expected to be fed across 626 schools.